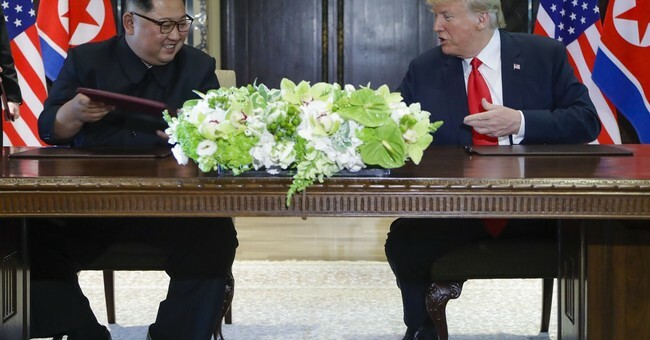 Last week, President Donald Trump met with Kim Jong-un in the first ever leadership-level summit between the United States and North Korea. As we look toward the future after the successful Singapore Summit, the United States must remember that our alliances with South Korea and Japan are the cornerstones of American strength and stability in the region, regardless of our progress negotiating with North Korea. As one of only two current members of the House who have visited Pyongyang, I have seen firsthand how the Kim dictatorship can distort reality when it wishes, which they could do at any moment during our negotiations in hopes of degrading our alliance with South Korea or weakening sanctions. Previously, North Korea has demanded that the U.S. and South Korea permanently end joint military exercises and evacuate our forces from the peninsula. This is a premature requirement that would threaten the safety of American families, though delaying some exercises may serve as a useful confidence building measure, which happened during previous administrations. We must be wary of any re-interpretation of the Singapore agreement by the North Koreans during these follow-up negotiations. History has shown that when our commitment to South Korea is lacking, North Korea will attack. In 1950, U.S. Secretary of State Dean Acheson failed to include South Korea in the U.S. “defensive perimeter,” and the U.S. declined to supply the South Korean military with enough tanks and anti-tank weaponry to deter the North Koreans. It was after these strategic failures that North Korea invaded the South, aided by Stalin’s Soviet Union. Suspecting the U.S. was distracted during the Vietnam War, North Korea launched a commando raid against the South in an attempt to assassinate their president, Park Chung-hee. We cannot let our commitment to South Korea waver, especially given our shared sacrifices and mutually beneficial relationship. South Korea sent 300,000 soldiers over nine years to help the U.S. and South Vietnam during the Vietnam War, losing over 5,000 troops, with 10,000 wounded in combat alongside Americans. In the post-9/11 era, South Korea promoted U.S.-led efforts by sending more than 20,000 soldiers to Iraq and over 5,000 soldiers to Afghanistan. Recently, South Korea invested billions of dollars to build and expand Camp Humphreys, a U.S. garrison in South Korea, and currently spends more than $800 million a year to support 28,500 stationed U.S. military personnel for peace through strength. While I am encouraged by the ongoing follow-up meetings generated by the Singapore Summit, we must not forget the importance of our relationship with Seoul and Tokyo, as well as the unresolved issues that affect the region, including the suffering of many North Koreans in concentration camps. President Donald Trump highlighted such suffering during this year’s State of the Union Address by focusing on Mr. Ji Seong-ho, who lost his legs while escaping from North Korea. President Trump also discussed the tragic murder of Otto Warmbier by North Korea, an American student who traveled to Pyongyang. Before Otto’s death, Congressman Adam Schiff and I introduced the North Korea Travel Control Act. This legislation would prevent travel to the country without a license, and for the safety of Americans, that license would be denied for tourism. While we introduced our bill before Otto’s death on June 19th, 2017, we had him and many other Americans in mind while drafting this legislation. North Korea cannot be allowed to kidnap Americans at the Pyongyang airport to use as hostages, which could occur again if negotiations collapse. They also must resolve decades of kidnapping Japanese citizens. If the U.S. and North Korea agree on concrete actions towards denuclearization, it is imperative that Pyongyang commits to allowing U.S. and international inspectors access to a broad range of sites within short-notice to ensure the safety of South Korean, Japanese, and American families. Short-notice inspections and wide access are essential to ensuring North Korea cannot hide a uranium enrichment site, which can be easily disguised and requires only a small amount of energy to operate. In addition to remaining committed to denuclearization, the international community must continue pressuring North Korea to dispose of their chemical and biological weapons, and the delivery systems for these horrific armaments. The U.S. alliances with Japan and South Korea form the fundamental bulwark of democracy, security, and freedom in East Asia. Maintaining and building upon these alliances ensures President Donald Trump’s maximum pressure campaign towards North Korea will continue to be successful, and we will be able to build on the positive results of the Singapore Summit.